Which are the right boots for my dog? Dog boots sound like the perfect solution to your dog's paw issues. Now you've got to choose the right boots for the job. That can be a confusing prospect as there are a lot of options out there... all with different considerations including cost, quality and design. At Waggle we've been helping people get the right boots for their dogs for 5 years and we'd love to share our experience with you. Select your dog boots based on functionality. This seems kind of obvious but it's not always as intuitive as you'd think. If you are buying dog boots for frequent long term usage it's best to get something that's both durable and comfortable. Cheap fru fru dog shoes just aren't going to do the job! Have a serious look at the structure of the boots and of the material the soles are constructed from. We choose to sell dog shoes which are as close in performance to human shoes as possible. We favour the Ruffwear range because they wear very well and have a lifetime warantee against any manufacturing faults. Ruffwear's Grip Trex style boots have soles made from Vibram which you may be familiar with as the same material used in high performance sports shoes for people. These are the same dog boots worn by the Australian Army dogs on special overseas missions. We know because we supply them. Also, all Guide Dogs in NSW and WA wear Ruffwear dog boots to protect their paws from rough surfaces and hot pavement. Dogs in high places have given the Ruffwear range a double paws up. Ruffwear supplies three different styles of boot. Which one you choose depends on your dog's activity level and activity range. I'll run you through the three different styles below. 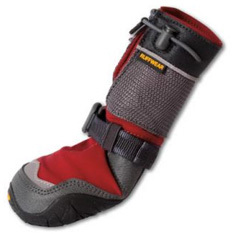 Ruffwear Grip Trex Bark'n Boots are lightweight boots with super traction and sturdy soles. The soles are made of Vibram, a material you may be familiar with as it's used in the soles of high performance sports shoes and hiking boots for people. The uppers are a very breathable mesh which keeps out debris but allows your dogs' paws to stay nicely aerated. Dogs do sweat from their paws so this is an important factor if your dog will be wearing the boots over long stretches of time. 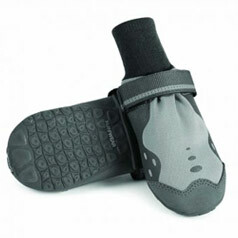 Grip Trex Bark'n Boots are great for robust activites on uneven grade such as trail running or bushwalking. They're also suited to high speed activities on bitumen. Ruffwear Bark'n Boots are the same dog boots worn by Australian Army Dogs on special missions overseas. They are also worn by all Guide Dogs in NSW and WA to protect their paws during long hours of work. The soles of the Grip Trex Bark'n Boots are non-marking. Ruffwear Summit Trex are a boot Ruffwear brought out to serve as an everyday shoe for dogs. These boots have rubber soles rather than Vibram, but their soles are flexible, lightweight & sturdy, and they provide excellent traction on tile floors, boats, bitumen and grass. Summit Trex are perfect for use on hot pavement or other difficult surfaces to protect your dog's paws.They can protect sensitive paw skin from allergens and irritants such as grass seeds and bindis. These boots are perfect for senior dogs who slip on surfaces such as tile, polished wooden floorboards, boats, etc. They also suit dogs with hip dysplasia, arthritis and other conditions where your dog could use some added traction to make getting up and around easier. Summit Trex Dog Boots are breathable and the soles are non-marking. 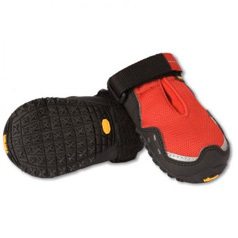 Ruffwear Polar Trex Dog Boots were specially designed for wear in snowy and icy conditions. The Vibram soles provide excellent traction. These are a taller style boot than the other two and provide more paw and leg coverage. Customers are often drawn to this style because they they feel a taller dog boot will stay on better. In our experience the shorter boots stay on just as well as the longer boots so that's shouldn't be a consideration. These boots were designed for cold weather wear so it's important to keep in mind that they are warmer. Polar Trex Dog Boots are breathable but they do cover more surface area on your dog. I wouldn't recommend use of Polar Trex Boots on your dog in extreme heat conditions. If your dog has a severe allergy or requires extra protection coverage on the legs Polar Trex may be the best option for you. If your dog drags his or her paw due to an injury or medical condition your best boot choice will be the Ruffwear Grip Trex Boots. These boots have the most heavily reinforced upper above the toe, which is the area that takes a beating when your dog drags a paw. While none of the boots were designed for wear on the uppers, these boots are the best for this job. If you purchase boots for a dog who drags a paw we recommend that you reinforce any areas on the upper which will experience extra wear with rubber cement. This creates a protective coating kind of like an extra bit of sole on the upper. When the rubber cement wears thin just reapply. This will give your Grip Trex Boots the longest possible wear and has worked well for our customers. Sizing is crucial. To be sure you're getting the right size shoes for your dog have a look at our guide to Getting the right size boot for your dog.